San Carlos de Bariloche is a city of some 113,000 located on the south shore of one of Argentina’s larger glacial lakes, Lago Nahuel Huapi. It is on the northern edge of an area known as Patagonia which stretches all the way down to the Strait of Magellan and Tierra del Fuego. Also running south is the Andes mountain chain, next to the Himalayas the most impressive of the world’s mountain ranges. Its peaks and the flow of rivers from its slopes determine the border between Argentina and neighbouring Chile. However, the main draw is undoubtedly those mountains. Since the 1930’s they have made nearby Cerro Catedral, 20 kilometers west of the city, one of South America’s premier skiing destinations during the southern hemisphere winter from late June to early October. 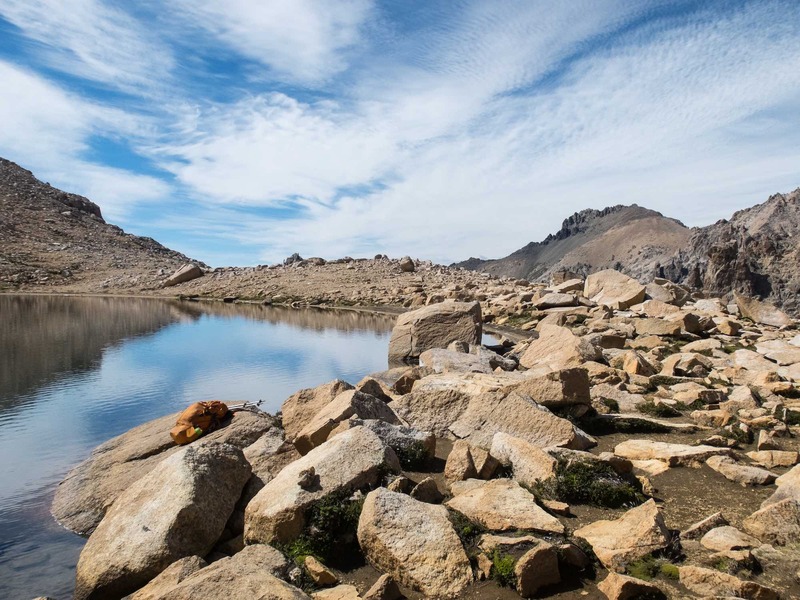 And in the summer the focus changes to hiking and rock climbing as people arrive to walk the trails, many of them leading to one of a series of refugios maintained by the Club Andino de Bariloche (CAB). 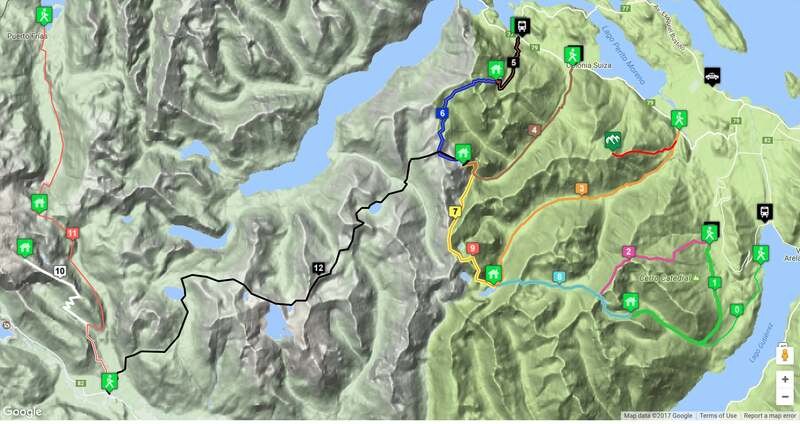 The red oval on the map above indicates the general hiking area to the west of Bariloche. You can easily fill up a couple of weeks with moderate to strenuous hiking that will usher you into some stunning mountainscape. Glacial lakes are surrounded by steep valley walls of scree and scraggy ridges and peaks. Since the trails – and the peaks – are not super-high (with 2100 meters being the highest you’ll probably get), acclimatization is not an issue here. 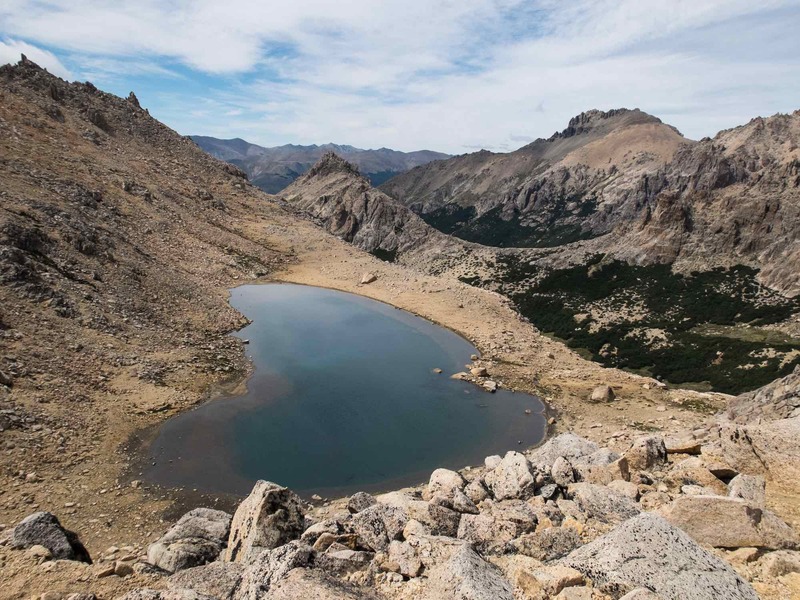 i have just returned from Bariloche after a too-brief sampling of the hiking possibilities inside that red oval; what I found was much more than what I expected and I was left wishing I had allocated more time. As it was, I was already committed to a climb of Volcan Lanín to the north of San Martín de los Andes so I off I went, leaving unwalked some great trails. Maybe reading this post will mean you don’t make the same mistake! 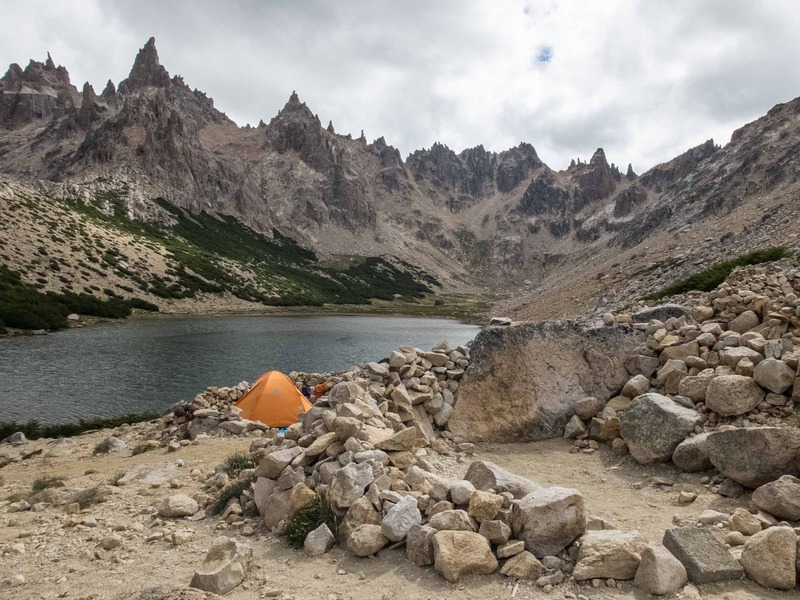 I titled the post Base Camp Bariloche because for hikers that is what Bariloche becomes as they plan and do their various trips. Hikes start from and end up back in the city, as people leave their duffels behind at their hotel or hostel with the surplus stuff they don’t need to carry on the trail. Transportation can be quite cheap -e.g. the city bus to Villa Catedral – or reasonably priced -e.g. the CAB (Club Andino de Bariloche) mini-bus to Pampa Linda. Other than registering for Refugio Frey, there is remarkably little paper work to do or fees to pay. Numerous camping stores have the supplies you may need to get before setting off – trekking poles, tents, sleeping bags, butane gas canisters, dehydrated foods, etc. though it really makes sense to arrive from home with the gear you need. If you choose the refugio option – as opposed to tenting and cooking your own meals – then many of the above items will not even be necessary. Once I checked in to my hostel, I started off by visiting the CAB info kiosk next to the main building for maps and guidance and recommendations; I followed that up with a walk across the street to the Park Information Center to register. Near the CAB office is a small grocery store for last-minute food purchases. My room at Hostel 41 Below was a two-minute walk away from all the above! Prime hiking season corresponds to the two-months that students have off for summer vacation – i.e. January and February. By then whatever snow was covering some of the higher trails will have melted and the weather should be at its best. The additional hikers on the trail provide an additional element of safety in case of emergencies. However, once you go beyond the more popular sections of the trail you will see almost no one! The shoulder months of December and March also have less rain and warmer temperatures and the trails will be even quieter than during the peak months. Refugio Frey is open all year; the other refugios are open from at least late November to April but see specific refugios for exact dates. Snow may still be an issue on some of the higher trails in December. The CAB staff will be able to provide the latest information. Since it was published in 2009 some things have changed – for example, recommended bus routes and connections, prices, some refugio rules and regulations , etc. However, the descriptions of the various trails and the information on flora and fauna remain useful and accurate. The Trek Bariloche website has tons of accurate up-to-date information and advice. Each of the menu items in the header above opens up to a dozen more web pages. The site is maintained by someone who lives in Bariloche; he mentions that he has been hiking in the area since 1999. Thanks to his enduring passion, other hikers can easily find the info to plan their own outings. The Club Andino de Bariloche is another essential source of information if you are planning to spend some time hiking in the area. 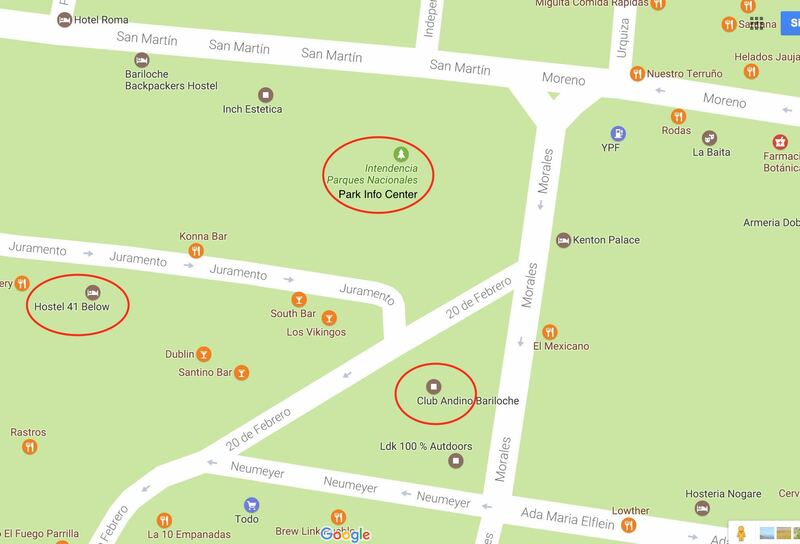 Already noted above is their information kiosk on Calle 20 de Febrero #30 just a street above from the Park Building. I spent twenty minutes there getting briefed by one of the club members. (While I try to keep to Spanish, both of the people at the desk spoke some English too.) Their website also has a lot of info. 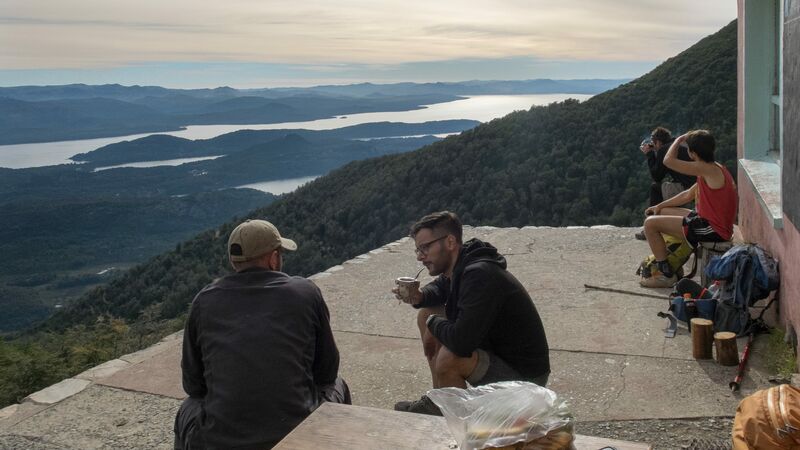 Since it is only in Spanish it will also provide you with a ready-made opportunity to learn some new vocabulary, words 100% related to the hiking you are about to do! I found the staff at my hostel on Calle Jugamento to be very helpful. While they had undoubtedly already heard all the questions I asked, the staff pointed me in the right direction for bus tickets and hiking permits and last-minute food shopping! As a vegan, I had picked this hostel specifically for its vegetarian breakfasts and suppers; I was not disappointed with the all-you-can-eat portions of tasty food that staff prepared each day. When I went on my various hikes they put away my duffel until my return to the hostel, which became a home away from home for my ten days in Bariloche. I just realized that I keep using the term “hiking” while all the material I recommend uses the term “trekking”! Perhaps there is no real difference between the two but to me a trek is an organized multi-day journey with a guide where pack animals – yaks, llamas, mules – carry the bulk of the equipment – the food and sleeping and dining tents and fuel, as well as the personal gear of the paid clients – while I get to walk with a few things in my day pack. A hike (at least to me!) is a self-supported walk where I carry everything myself. It can be a day hike; it can be multi-day… but when I hike I am also the pack animal! Is that how you see it? Maybe I am overthinking this! Perhaps trekking just sounds more exotic than hiking? Let me know your take in the comments below! The most popular hike is the one from Villa Catedral at the base of the famed ski resort to Refugio Frey. With an early morning start you could walk up to the hut on the shore of Laguna Toncek, have some lunch and then walk back to Villa Catedral. Another approach makes use of the ski resort cable up to the top of and then a walk down the scree slopes of Laguna Toncek and a walk along the shore to the refugio before descending the Von Titter valley on the trail back to Villa Catedral. You could break the hike into two parts by spending the night at the refugio. The Catedral bus from downtown Bariloche is all the transport you need. Another popular day hike (5 on the map above) is the one up to Refugio Lopez and then back down. An overnight at the hut would give you time to hike up to Pico Turista with its fine 360º views including a great one of Cerro Tronador. A third popular overnight hike is the one to the edge of the glacier below Cerro Tronador. A bus ride from the CAB office takes you to Pampa Linda where you start your hike up to Refugio Otto Meiling, a CAB hut with room for 60. Tenting is also a possibility. You could combine the walk to Refugio Frey with one to the next refugio (San Martin) before heading back down to the road and a bus back to Bariloche. 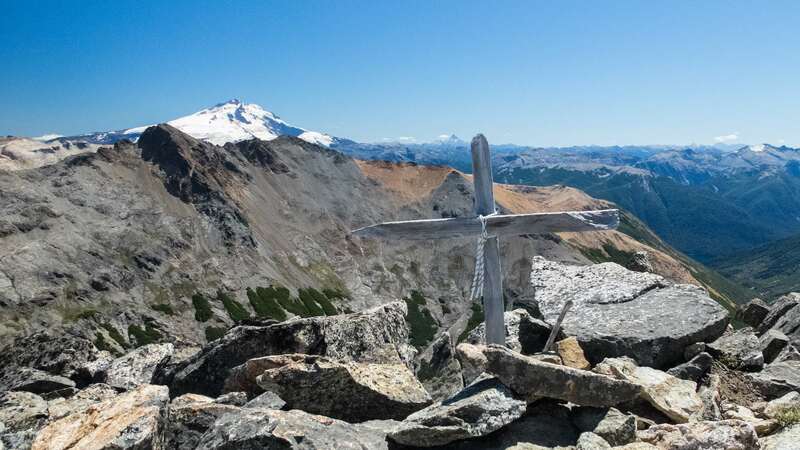 The Nahuel Huapi Traverse is a five-day hike that takes you to a different refugio each day. After hiking to Frey and then San Martin on the first two days, you have a choice. 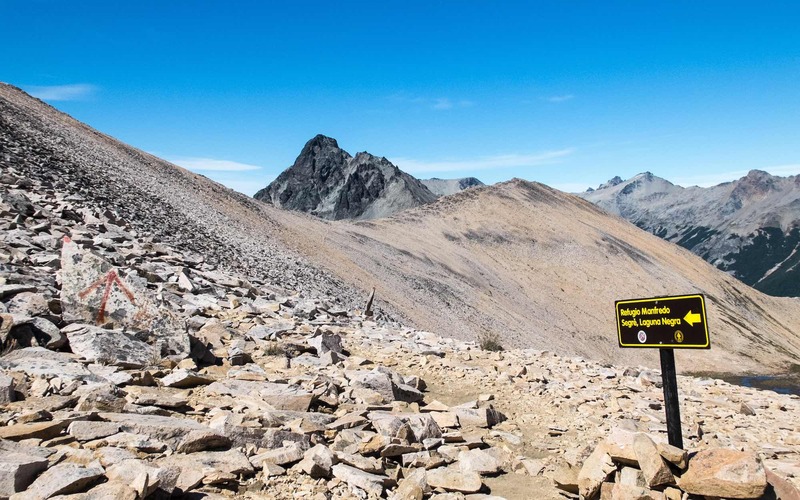 You can take on the demanding hike from Laguna Jakob to Laguna Negra on a poorly marked path after having signed a waver acknowledging that you understand the risks! If that sounds a bit much, you can descend to the road and a hitch a ride to Colonia Suiza where you can tent overnight. The next morning you go up to Laguna Negra on an easy woodlands trail. From Laguna Negra the traverse goes to Refugio Lopez before coming down to the highway below. The reward for your effort: perhaps the best single multi-day hike in Patagonia! I wrote the above post on El Chaltén four years ago after a three-week visit to the area as well as to Torres del Paine on the Chilean side. It had been a great trip even with the crappy weather! From my very limited Argentinian hiking experience, I created what I thought was an eye-catching title for my post. Well, I have learned that it is not true! Since there is yet more of Argentina to explore, I won’t now go ahead and declare that actually Bariloche is “Argentina’s Hiking Capital”! 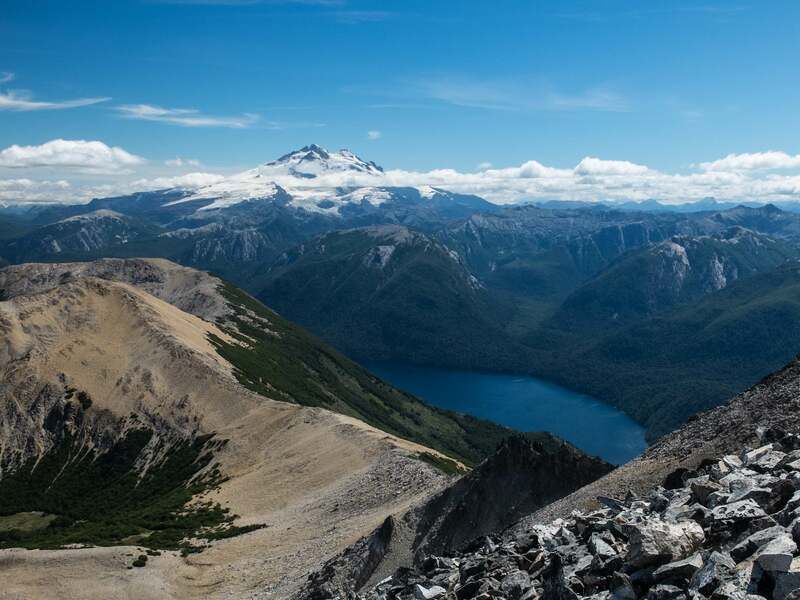 BUT – When I compare the Nahuel Huapi Traverse and the other nearby trails to what I walked in the Andes above El Chaltén, the hiking trials west of Bariloche are without a doubt more spectacular, more challenging, and much more extensive. It is not that Fitz Roy is a waste of time; it is just that the Bariloche area gives you more “wow” for your time and effort. 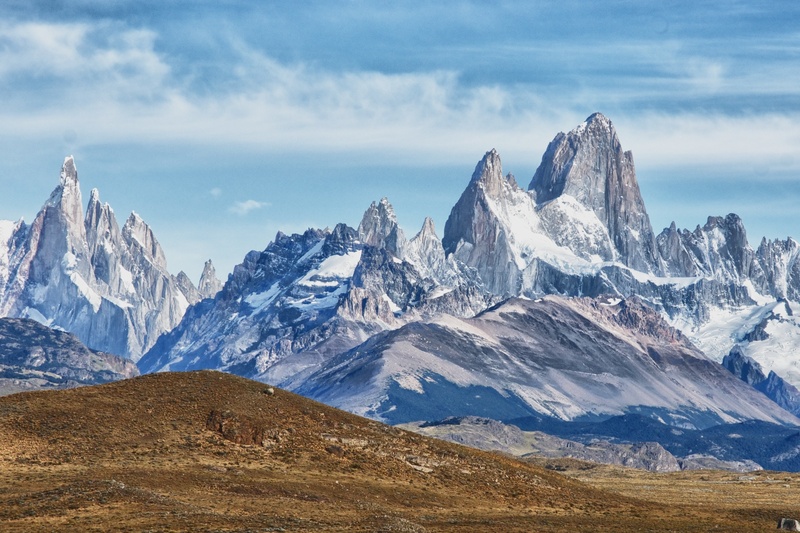 Of course, if you are going to be in southern Patagonia you have to visit El Chalten and the trails around Fitz Roy! However, to spend all that time (or money if you fly!) getting down there just to do Fitz Roy while not going to Bariloche and Nahuel Huapi – well, that does not make sense! The map below shows the traverse and a number of different variations. I followed the solid blue line except for the Day 1 section where I took the broken line route to the Van Titter valley and then walked up to the Refugio Frey. The Lonely Planet Day 1 route makes use of the chairlift ride as shown in solid blue on the map. My next post will have all the details! 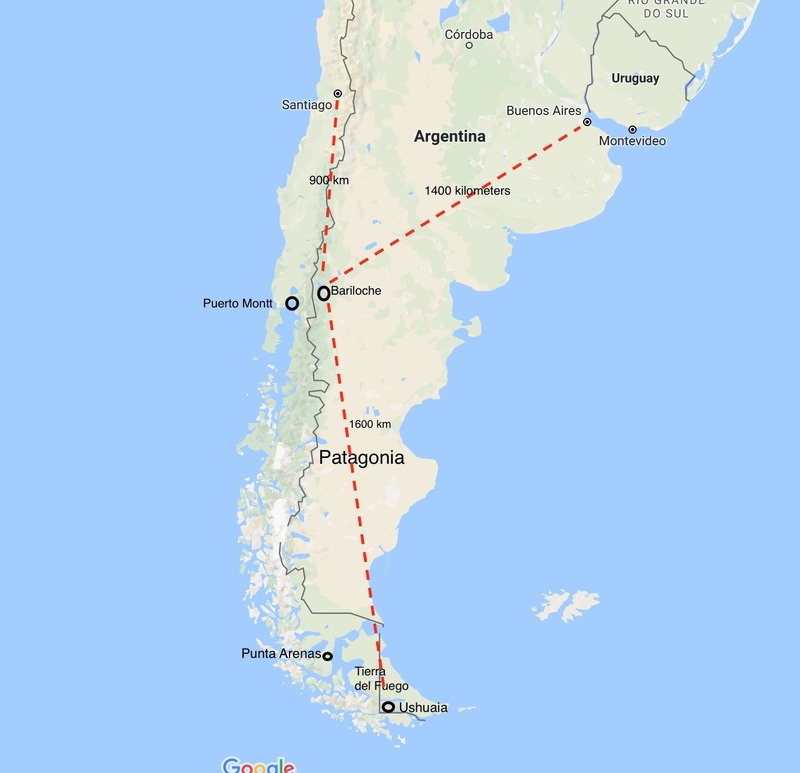 Another multi-day option (10 +12) – one that I did not do but got a rapturous review of from a couple of German hikers – is the one that would take you from Pampa Linda to Colonia Suiza over five days. They combined it with a visit to the Otto Meiling hut. The Ultimate Multi-Day Adventure: On Day 2 of my Nahuel Huapi Traverse I met Moritz at Refugio San Martin. He had started off at Villa Catedral and was headed for Peulla on the eastern shore of Lago Todos Los Santos on the other side of the Andes in Chile! We did the steep climb above Laguna Témpanos together and then he was gone, travelling at a speed beyond the one that Diego and I dialled into. After he got to Laguna Negra he apparently headed west on the trail marked #12 on the map above. How he crossed the Andes is still unclear to me but his goal was Peulla on the east shore of Lago Todos Los Santos. (He may have walked the gravel road from Puerto Frias to Puella.) From there he planned to take the catamaran to Petrohue and continue on to Puerto Varas. I really need to send him an email and get the full details! There are enough incredible trail combinations and possibilities to keep a keen hiker going for two or three weeks. Stunning views of craggy peaks and glacial lakes with be interspersed with difficult scree scrambles up and down steep valley walls. Other than the beginning day of the hike you will probably see few people. 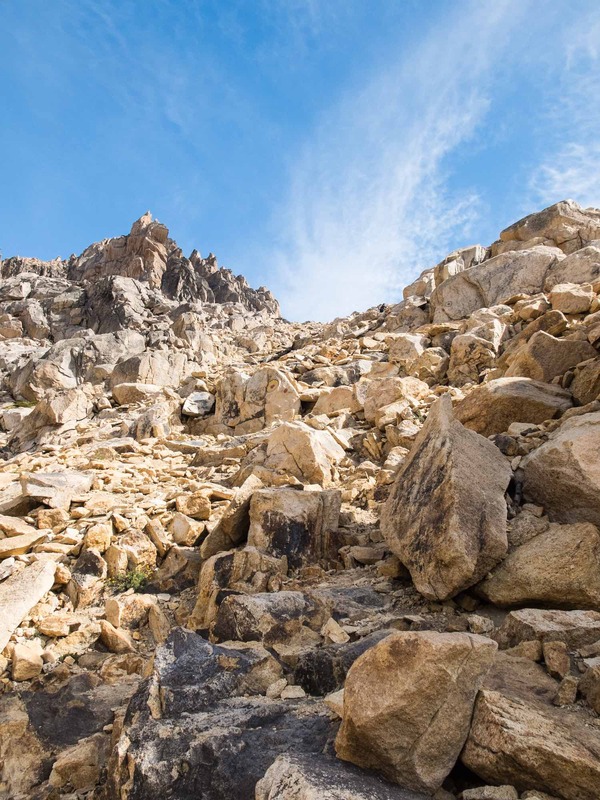 You really need to be prepared for the worst in terms of weather and possible injury; having a hiking partner or knowing that there are other hikers coming up behind is always a good thing! I had my Spot Connect, a GPS tracker and SOS device. While I did start off my hikes on my own, in all cases I ended up walking with another person or two and occasionally looked out for them on the trail when we got separated. I used the refugios – and the tenting spots nearby – as the end points for each day’s hike. Knowing that a foam mattress in a mountain hut is available in case the weather turns bad is always a comforting thought! Luckily the weather during the ten days I spent in the Bariloche area was a succession of sunny days with little wind and not a spot of rain. It isn’t always going to be that way! My time in San Martin de los Andes, however, was marked by steady rain and high winds and much cooler temperatures. Up on the slopes of Volcan Lanín some ten to fifteen centimeters of snow fell. Needless to say, I did not do my Lanín climb! I did, however, get to know San Martin very well during my four-day stay! This entry was posted in Argentina, hiking/trekking and tagged Bariloche El Chalten compared, bariloche trekking, hiking routes patagonia, Nahuel Huapi Traverse, Patagonia #1 Hike, patagonia best hiking trail, patagonia hiking, Patagonia hiking - best time to go, patagonia hiking blog, patagonia trek report, patagonia trekking, trekking trails patagonia. Bookmark the permalink.